Abstract: Mawi DNA Technologies has developed the iSWAB sample collection system and Copan is producing FLOQSwabs™ (hDNA free, certified free of human amplifiable DNA, DNase and RNase free). 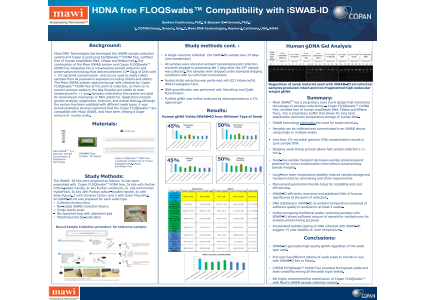 The combination of the Mawi iSWAB system and Copan FLOQSwabs™ hDNA free integrates into a non-invasive sample collection and preservation technology that delivers between 10 - 30µg of DNA with < 1% bacterial contamination and can be used to easily collect samples from all population segments including infants and elderly. The Mawi iSWAB system captures buccal cells collected by Copan FLOQSwabs™ hDNA free at the point of collection, so there is no need to process swabs in the lab. Samples are stable at room temperature for >1 year. Samples collected by this system are ideal for downstream microarray or NGS platforms. Applications include genetic analysis, epigenetics, forensics, and animal testing. Although the system has been validated with different swab types, it was demonstrated by several customers that the Copan FLOQSwabs™ are compatible with Mawi iSWAB, and have been yielding a larger amount of nucleic acids.